Literary, anything and everything can and will happen in composer John Zorn’s constantly evolving musical world. Within that world, surprise and exploration are an important ingredients, as much as the cross-styling or the plethora of approaches for the different kinds of collaborative compositions he has created for the players involved. 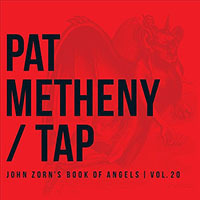 This surprising crossed paths of Zorn and guitarist Pat Metheny, as one of the performers/interpreters of his Book of Angels series (a subset of Zorn’s ongoing Masada saga), is a cause of wonderment of “what’s it all about,” as in both artists’ long and storied careers there were no prior meeting points. Zorn has mostly worked closely with Downtown artists or artists related to his Tzadik label, and his works have never, until now, featured a towering composer/player of Metheny’s stature. But the liner notes reveal that both artists had been following each other’s careers with great interest, and had been communicating intensively. Metheny’s career is littered with occasional twists and risk- takings that are miles apart from the classic sound he has created and by which he is identified. Recently, he has been defying expectations by challenging and offending the status quo with a string of stylistically and conceptually different records, and Tap: John Zorn’s Book of Angels | Vol. 20 is no exception. Tap is a meeting of two highly individual and original composers, conceptualists and players, but not in that order. One of Zorn’s characteristics and strengths is that he always composes works that gives space and emphasis to his artists’ identity and character. While his compositions from the Masada series are based on Jewish scales—spiked with influences from the world of jazz or anything at hand—they are used more as a template upon which the artists can build. While Metheny is no stranger to covering compositions by jazz composers or songs from the pop world, as heard on the brilliant What’s it All About, (Nonesuch, 2011), Tap is only his second time playing compositions written by an avant-composer, as he did on composer Steve Reich’s Electric Counterpoint (Nonesuch, 1987) (which was made even more popular when it was sampled for the ’90s ambient house hit “Little Fluffy Clouds,” by Britain’s The Orb). But the dynamic and brilliant opener, “Mastema,” features precise repetitive patterns and melodies, much in the style of another minimalist composer, Philip Glass, and when Metheny introduces his army of instruments it bursts into an avalanche of sounds. Backed by drummer Antonio Sanchez’s intricate and playful 11/8 rhythm, this track introduces different textures and ambiances, with swirling guitars, fuzzy tones, loops—and a certain eeriness that, contrary to the ambient backdrop typical for Metheny’s work, is closer to the kind of music found on Tzadik. “Albim” is a soft and gentle acoustic number, with subtle, folkloric sounds and melodies that are masterfully and almost unnoticeably interwoven into the fabric, the acoustic textures and drums teasing out some tension between the soft and hard edges. “Tharsis” has those serpentine, eastern Jewish melodies more upfront, played repetitively and dynamically with a swirling middle section resembling a Balkan gypsy ensemble in full swing. The music becomes hypnotic while remaining exciting—even breathtaking. Joyful and celebratory, the acoustic and tender “Sariel” is set in several stages, with Metheny making unexpected breaks when he injects electric guitar madness. The track has enough ideas and surprises to successfully avoid some repetitive lulls. It introduces some alien soundworlds and, especially towards the ending, overloads with layers of electric guitar noise and drums much in the manner of alt-noise rockers Sonic Youth. There is a reckless abandon on the closing “Hurmitz,” as it tumbles with an outpouring of sonic flurries and noise, accentuated by Metheny’s piano injections, dueling with Sanchez. From “Mastema” to “Hurmitz,” Metheny infuses each composition with a variety of known signposts, but with a prevailing number of points of departure; there are no unsatisfactory tracks to be found, though some may impress or dazzle more than others. That the paths of these two towering figures have crossed is always welcome, but more important is how Metheny has placed his imprint on Zorn’s music in an idiosyncratic way. Full of aggressive, dirty and equally tender vibes and melodies, with immersive textures that give each composition a different kind of depth and character, Metheny’s production grants this record its own law of gravity, even within his own oeuvre. Track Listing: Mastema; Albim; Tharsis; Sariel; Phanuel; Hurmiz. Personnel: Pat Metheny: acoustic and electric guitars, baritone guitar, sitar guitar, tiples, bass, piano, keyboards, orchestrionic marimba, orchestra bells, bandoneon, percussion, electronics, flugelhorn; Antonio Sanchez: drums; Willow Metheny: voice (6). t r e m o r – new mix; ambient & ambient dub: mostly from Relaxed Machinery announced artists & new music found on the RM site.